Her Royal Highness The Duchess of Cornwall GCVO PC is 71 today. Her Royal Highness The Princess Charles Philip Arthur George, Princess of Wales and Countess of Chester, Duchess of Cornwall, Duchess of Rothesay, Countess of Carrick, Baroness of Renfrew, Lady of the Isles, Princess of Scotland. 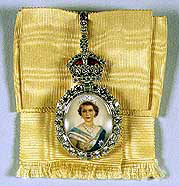 In 2007, HRH was appointed to The Royal Family Order of Queen Elizabeth II. In 2012, Her Royal Highness was appointed Dame Grand Cross of the Royal Victorian Order (GCVO), as illustrated on HRH's armorial bearings. In 2016, HRH was appointed a Privy Counsellor. It must be coming near time for HRH to use her first title of Princess of Wales. One wonders how long we will have to wait. Quite right. An absolute absurdity that she cannot be known by her rightful, legal title.